Oh man! I gotta make me some of that. Not many pies have a theme song, you know. Seriously, though–we’re gonna regret schadenfreude? I am going to make that. 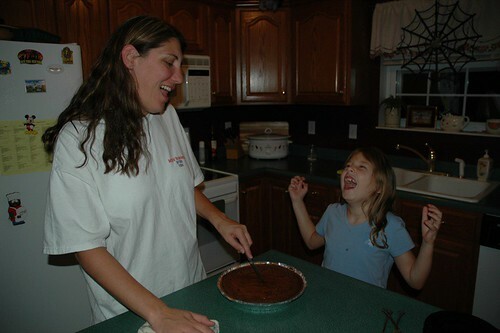 I love the photos, particularly the ones of Athena and Krissy laughing maniacally after taste testing the pie. I hate sweets, but I love your slide show. Thats just too good a family and life you gots there. I may be in a minority here but I’m more impressed that you invented a new pie then when you taped a piece of bacon on your cat. Schadenfreude is one my favorite words. All. Time. Still, the pie might be a bit much. Glad everyone enjoyed it. Man, I miss Fafblog. Thanks for stepping into the pieblogging gap. On my Sony laptop with the awesome screen (no anti-glare texture on the glass) sitting in the dark of the living room, the picture of the pie in the oven… the pie looks like some malevolent black hole, sucking all the light out of the room. If someone else would die. With apologies to Dennis Lee. Will you be making Klingon Revenge next? Taste fine warm, but, of course, best served cold. I just reviewed the pictures, and in NONE of them does Athena have the kalua in her area. I was kinda worried about that once lemon mentioned it, but then, I looked at the joy The Boss’s family had during the slide show and I was completely enamored at his wife’s cheekbones, and how that feature is passed so prominently to his daughter. If you can come up with a Schadenfreude cake I could serve it to my mother-in-law for her next birthday, and be eternally grateful. I’d imagine that such a cake would involve black icing, which I’ve already perfected whilst making a Darth Vader cake one year. All the kids’ mouths turned purple, and stayed that way for about a week. It was awesome. Mmmmm. The misfortune of others never had such a flaky crust. Pie is a big thing for you, isn’t it? Figures prominently in OMW. And here as well. Hey, is Krissy like 6’2″ or something? She looks rather statuesque in pictures. Especially the one with teh bat. If so, it means Athena is 5’4″ at age 7 which is possible (my niece is 11 and 5’10”. Yeah!) That makes you…? Krissy is 5′ 10″. I’m just a shade under 5′ 8″. Athena is well over four feet tall. 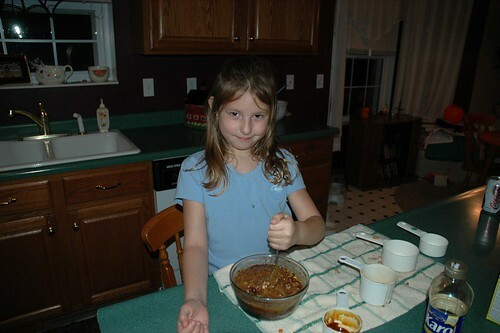 I love Athena’s expression as she’s mixing the pie. I was totally with you until the graham cracker crust, but I guess that’s just for color. I’d also be tempted by some ground roasted pecans, and possibly nutmeg and allspice. Bitchin’ idea though, and great shots. I use graham cracker crust for two reasons. One, it’s easy. Two, the filling carmelizes against the crust and makes it chewy and excellent. Reminds me of shoofly pie, a staple in Amish country. Oh, and Ginny? Howz about sharing the Darth Vader cake recipe? Indeed, it’s not unlike shoofly pie. Ignore that pecan and nutmeg stuff above. I was clearly on crack. What I would try is 1/2 tsp. of dried ancho chile powder. Fits the theme, and the chocolate/ancho/cinammon/coffee combination has to be tasted to be believed. Actually, I suspect this is part of a larger trend towards Foods of Darkness. Liquor made from the distilled despair of shattered dreamers has become quite popular at College Republican gatherings, and prime rib delicately seasoned with the crushed dignity of outsourced workers has become *the* dish at five star restaurants. I love that you’re a whole family of nerds! You guys always look like you’re having so much fun. I would think schadenfreude pie would best be served in heaping huge slices, myself. The Kahlua is in Athena’s milk. Sheesh, do you people not have kids? Oh man, this looks incredibly delicious. I’m going to have to try out this recipe while my wife is in Singapore next month (so that if I screw it up, I won’t have to inflict it on her). Isn’t that chocolate black-bottom pie? I wouldn’t be surprised if it is very similar. I think the cinnamon and Kahlua may differentiate it. For those keeping score out there, the basic pie here is a “chess pie,” which is a pecan pie, minus the pecans. Pecan pies usually use light corn syrup and light brown sugar (and no molasses). 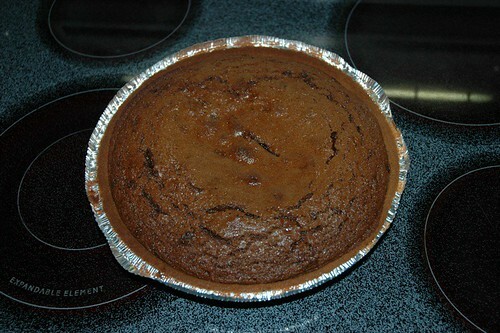 I used dark versions of the corn syrup and brown sugar added chocolate, molasses, cinnamon and the kahlua. Of course, I made homemade mac & cheese for dinner last night, so I’m a fine one to talk. Want to trade you home-made Mac-n-Cheese recipes? It’ll be good with Schadenfreude Pie for dessert! Oh, sure. My family does something together, just like all those family experts tell us to, and suddenly we have too much time on our hands. That’s it. Back to the salt mines for Athena! The pie looks tasty, too. By all means, Alison. Have fun with it. I get paid in a week or so, and will be having a dinner-party sort of thing. And it’s getting chilly, so baking is good. And I really want an excuse to have brown sugar in the kitchen; I was one of the kids who’d steal it and hide it in my bedroom just to eat. Now all I have to do is find someone else’s misfortune. Maybe the partiers nearby will do something stupid like burn a house down. Schadenfreude is illegal in Singapore. Hell, isn’t pie illegal in Singapore? Only if you spit it out on the sidewalk. Is it anything like guilt pie? Someone on a mailing list I’m subscribed to mentioned reading in a book about guilt pie. Basically, whenever some disaster happens and lots of people want to shoulder all the guilt themselves even it was not the fault of any one person, someone bakes a pie and slices are handed out to everyone. Each slice represents each person’s share of the blame. Of course, this sort pie would work just as well for lots people wanting to claim credit for something good happening. Or if you make a pie with gum, I suppose. This has been an inspiring post. I want to have a pot luck where all the meals are metaphysical concepts, brought to tasty life. Behold: Forbidden Fruit Cobbler! Revenge Vichysoisse (served cold, of course)! And a bunch of other things that I’d think about if it weren’t lunchtime and I weren’t so damn hungry! Jennie, my Darth Vader cake was a devil’s food cake (you can buy a mix, or use your favorite “from scratch” recipe) but the key here was that it was baked in a Darth Vader-shaped cake tin, which I got at a garage sale years ago (and ultimately sold at a garage sale of my own when my children grew out of silly-shaped cakes). The key, really, was frosting it to make it look precisely like Darth Vader; this was accomplished by heading out to my local party store and buying a load of frosting equipment, including the dyes they had to make your own colored frosting that you’d mix into white frosting. When it came to black–and most of the cake was black–no matter how much black dye I used, the frosting stayed grey; so rather than a couple of drops of dye I poured an entire container of the black dye into a tub of frosting. It turned a glossy jet-black, and so did my fingers–well not black, more like purple. mmm-mm! The kids mouths also dyed purple when they ate Darth, much to my amusement and the chagrin of the parents whose children attended that particular birthday party. The cake pan I used, I just discovered, is a rare> cake pan. I just found it as part of a set of four on eBay for TWO HUNDRED AND SIXTY DOLLARS. Maybe I shouldn’t have sold it at my garage sale for fifty cents. Pie is good. Pie is kind. Except this one, which I want to try. Poste haste! Wow, how both funny and delicious! Wow, that looks tasty. Now I want to make it, and eat it, but we have almost none of the ingredients. (We have Kahlua, chocolate chips, butter, and cinnamon.) Feel free to revel in my misfortune now. 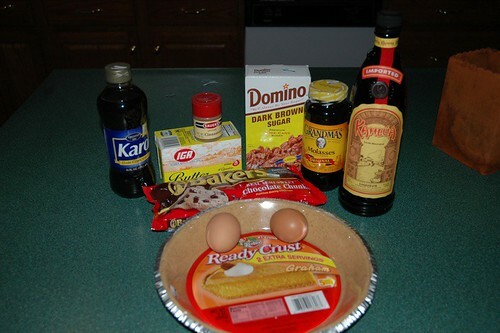 I’m going to gather the ingredients together for a couple-three Schadenfreude Pies on November 7th. If things go well for the Republic, I’ll bring them into work in the morning. Just made the pie, and oh my lord, so good! Thanks for the evil yet delicious times. My girlfriend liked it so much, she’s going to bring it to the preschool she teaches at tomorrow. For the teachers, not the kids, thank god. Three olds hopped up on brown sugar, corn syrup, molasses and chocolate doesn’t seem like the best idea for some reason. By the way, for an added kick, instead of just plain milk, I ended up making Kahlua and milk as the perfect drink to go with the pie: wholesome milk coupled with sinister yet oh so tasty coffee liqueur. Mmmmmm…..
We often have Thanksgiving at the home of our friends Barbara (whom we call “Barbaa,” because that’s what Julie calls her, because that’s what her signature looks like) and Dave. Of course we bring something. One year, our assignment was to stop by Marie Callendar’s to pick up pie. You have to go to Marie Callendar’s early to get pie on T’giving, the wait is, like, a half-hour. Everybody wants Marie’s pie for T’giving. Wait, I didn’t tell you this part: Julie and I both wear earplugs when we sleep, because we both snore. Okay, now I told you that part. Cracked me the F up. I laughed out loud. I think al franken is borderline retarded, but I agree with his opinion on families. It isn’t just about quality time, it is about wasteful time, as long as you are spending time with your wife and your kids, it is always quality, and it is clear that you and your wife have something along those lines acting. Still. . . .That’s it. Back to the salt mines for Athena! If you create a new world, Please! have one that includes parents sending their beloved children to the salt mines. That is just a flogging funny contrast. ajay, you almost made me spray soda over my keyboard! Of course it’s OK, but I want to read that story when you’re done. That’s even more fun than when Robert Jordan named one of his Aes Sedai Kiruna, or the Gene Wolfe novel The Sword of the Lictor, which was translated as Liktorns svärd, The Sword of the Foot Corn. That is the most awesome pie I have seen. I must have this for my birthday. “The Sword of the Foot Corn”. I like it. Apparently a garbled report of the forthcoming publication of “The Citadel of the Autarch” led to one magazine reporting news of Gene Wolfe’s latest novel, “The Castle of the Otter”. And “Space:1999” featured an exotic planet called Luton, which no doubt sounds all very skiffy (“Wel-come, tra-vell-ers. We bid you wel-come to Lu-ton”) unless you are British and know it as a rather dull town to the north of London. Skadeglädjepaj — A minor Norse god, associated with improper feelings of joy at others’ misfortune, and dark pies. 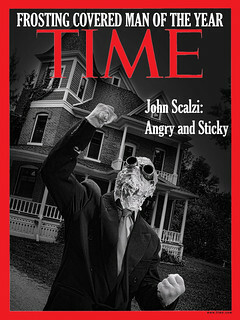 Hey, back off, Scalzi, I saw it first. Yeah, and you have me to thank for it! Be grateful, damn you! Ginny – I am eternally grateful. See, I surprised my husband with a Millennium Falcon cake at our rehearsal dinner (10 years ago). The bakery had never had such an unusual request. And the frosting was GRAY, oh so gray. Which I guess was alright for the MF. But a Darth Vader cake – too effing cool. Now if I just had $250 for the Darth Vader pan . . . .
All quantities are “roughly.” I like my mac and cheese strong, so the more sharp cheddar cheese, the better. Warm milk, gradually stirring in grated cheese. Wisk in a little flour at a time until the sauce thickens. Dump cooked macaroni in a glass baking pan. Stir in cheese sauce over macaroni, mix well. Break up bread over top of macaroni. Add additional grated cheese on top of break. Bake 30-45 minutes until bubbly. You can always add meat or veggies to this, but we tend to take our mac and cheese plain. Is it too much meta if I say that the asir certainly celebrated Skade‘s marriage to Njord with skadeglädjepaj? I think Schadenfreude Pie needs some vanilla ice cream to go with it. 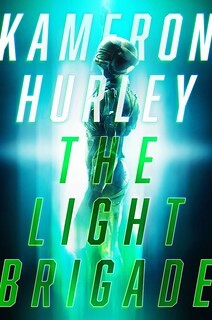 Or would that lighten it up too much? Schadenfreude a la mode? That’d totally be mixing linguistic genres. You could use an ice cream like Triple Fudge Brownie Bypass or whatnot, and call the whole mess something fancy like Schadenfreude coup de grace. Also, do not try to make cupcakes from the leftover mixture. This may be common knowledge for normal folk, but this is a warning for people like myself, who have no business experimenting in the kitchen. The schadenfreude mix does not work for brownies. Trust me. Or fill it with ice cream and call it a Schadenfreude Bombe. I came here because you were mentioned in the comments column of the relatively inactive Fafblog – my compliments to the chef, and family. As far as homemade mac and cheese goes – I like to kick it up to the next level with some mustard. This way folks! One at a time! the U.S. Constitution, or a dead 3-toed sloth. Thank you for letting us share in your delightful yet evil daily life! I’m enjoying your fortunes – including the gorgeous gorgeous I Want One for Myself green bittersweet berry border that seems to be this autumn’s “whatever” fashion statement. Yum so much to both! That is a great series of photos, my thanks to the photographer and thanks to the subjects for sharing their culinary adventure. Keeping with the theme and all what this pie needs a splash of distilled usernet bitterness. Or at least that’s what Sid would do. And your timing couldn’t be better! Just in time for the Foley Follies! Then I thought “Why bother?”. The Foley Follies seem likely to prove as good (bad) as it gets. 1) Wow, you do a great version of Fafblog! I’ve been needing a fix lately. 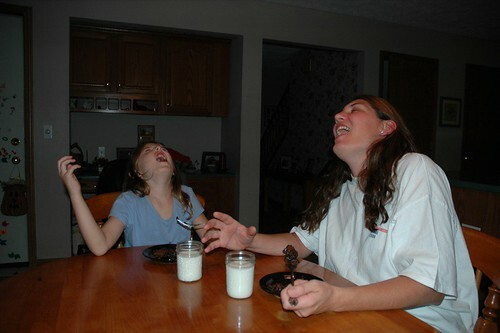 3) That’s the most decadent-looking Schadenfreude ever! aAny chance you can give us a recipe for crow that we can serve to those people whose misery we are so tastily enjoying? Wow, that looks amazing. I found this link off a friend’s journal–it just looks simply amazing. Do you mind if I use the recipe? I’d love to make it sometime. Go right ahead, Amanda. That’s why I posted it. Just when I was going to reach for a nice fat slice of Republican flavored Schadenfreude Pie, I was halted mid-reach by the online gambling rider. Doh. Foiled again by ‘conservative values’ saving me from self destruction (except when it comes to state lotto) and providing deliverance from my spiraling path to hell. It’s a good thing the GOP is around to show moral strength and leadership. It’s been a great victory for freedom and Democracy these last few years. Oh, you moral majority! What else do you have in store for me? What other freedom might I lose? How ironic if Foley was enjoying a slice of pie right now, and thinking of me… Eew. BEFORE YOU DIE, YOU SEE THE PIE. My friend and I tried making Schadenfreude Pie this weekend. It was a dismal failure. I’m not sure where we went wrong. We had a slightly too small amount of brown sugar, so we substituted white and a bit of molasses. But we ended up with a solid top and liquid gooey insides. Even with an additional hour of cooking time. Also – the recipe says 3 eggs, but the picture only shows 2. Maybe that was our problem? No, it’s definitely three eggs. Couldn’t tell you where you went wrong, except possibly to suggest your oven might not be evenly cooking (or alternately, may be running a temperature lower than it reports). I made 2 Schadenfreude pies this past weekend in honor of: 1) The Republican Party and 2) Mr. Foley. I think it just means more if you have a reason for the schadenfreude. I don’t really believe in schadenfreude for the sake of schadenfreude, mostly because it’s a heckuva a mouthful to say. I kind of hate graham cracker crusts with every fiber of my being, so I used Oreo cookie crusts instead. 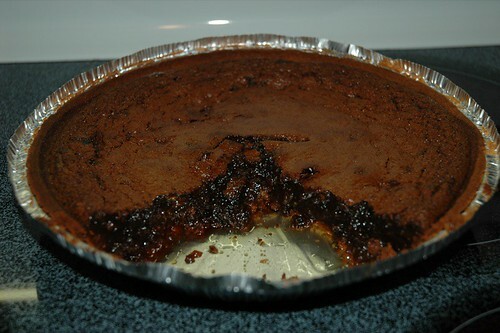 It made the pies look even darker: like tar poured into asphalt molds. I messed with the recipe further by using very dark 85% cocoa chocolate, and adding chocolate chips just before baking. 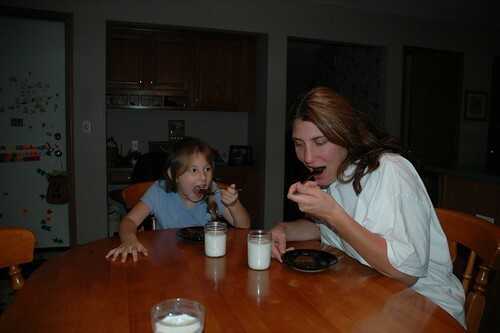 But some may say that I have an unhealthy relationship with chocolate. Thanks for sharing the concept, I think I’m enjoying it more than the pie itself. It amuses me to offer the pie to people and see if they get the joke. Well, had I had an Oreo crust, I would have used that myself, so I think that’s allowable. Likewise, 85% cocoa seems reasonable to me. Extra chocolate chips? Hey, it’s your pie. Gossip around work is that my two least-favorite co-workers are unexpectedly expecting. Therefore, it’s time for me to try out this recipe. Since I care, I’m bringing this to my ladies’ writing night tonight. I’m experimenting with two little custard cups of pie that do not have any of the booze, as one of my writing group ladies doesn’t eat items with alcohol ingredients. I put in more than the recommended amount of chocolate. The melted chips were 60%. The random garnish I threw in was 70%. I plan to shave some 70% on top. Mmmm, pie. I made two schadenfreude pies on Friday night for a party — actually, I ended up with enough batter for three pies, so there was much malevolance about. Perhaps that was part of your plan all along — the schadenfreude you get knowing that all that extra pie will be lurking in our kitchens. The knife inserted in the center of the pie never came out clean, though. 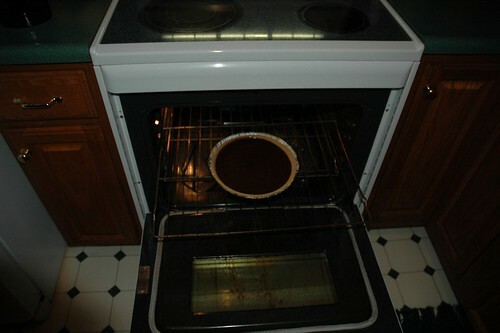 The pie was liquid when it came out of the oven and set just fine over the next 20 minutes or so. I think there were two people in the room who finished their slice — it’s so rich! And evil! And delicious! And it gave at least one person nightmares! Truly a success. Black icing – chocolate icing colored black. Gets a true black without that horrified parent effect. Of course that horrified parent effect is FUN. In two days, my Thanksgiving experience will be marked by SCHADENFREUDE! I attempted this pie for Thanksgiving, and it was an enormous hit. Goes well with vanilla ice cream, as well (though it becomes intrinsically less evil in the process). Mmmm…I’ll have to try that recipe. And I was inspired to post this link. But at least I can spell. that pie looks absolutely deadly. Like, death-of-any-stomach-deadly. Told my wife about this recipe this morning, and she said, “Guh, that doesn’t sound good at all!” So of course I had to make it. We both just had a slice with ice cream, which I have dubbed Shadenfreude Pie à la Hope. Funky texture, but altogether yummy. The look of awe on Athena’s young face as she takes her first bite of the pie… PERFECT! I tried to make a vegan version tonight, substituting margarine for the butter and applesauce for the eggs. I wouldn’t quite call the result a success, but I wouldn’t call it a failure either. I had two slices, and the second one is currently sitting in my stomach like a lump of iron, so I think there’s some sort of family resemblance between the two sorts of pie, even if there are also notable differences. I have a bunch leftover, and I can’t imagine it’s going to go bad any time soon. Maybe I’ll bring it to my dad’s for Thanksgiving. I tried to reproduce your pie, and I’d say I was successful. However, I still have trouble feeling joy at the misfortune of others (I also have trouble finishing the pie). This pie sounds awesome!! I have to try it. Should I feel guilty for wanting to? I wish I wasn’t going out of the country next week. I have been DYING to try out this recipe! It sounds so richly, darkly, and wickedly delicious! PLEEEEEASE send a pie- no, make that several- to the Westboro Baptist Church! They dance with gloating glee at funerals, and rejoice in the deaths of babies in the Australian bushfires. They would have to be the world’s most deserving recipients of this culinary marvel. i love this photo story .. i will return to feast again and again and again. Fluid or not, tho, it’s delicious! I’m refrigerating it to see if it gets things all settled a bit better. At least so it can be properly sliced. I’ve notice it’s sometimes inconsistent — one time I have no problem with it setting, other times it runs all over the place. I think if you continue to have a problem with it running, you can cut back the butter a bit. This is brilliant! The wife sent me this link yesterday and I just got around to reading the whole thing. The idea is delicious and the recipe is ingenious. Or is the idea ingenious and the recipe delicious?? 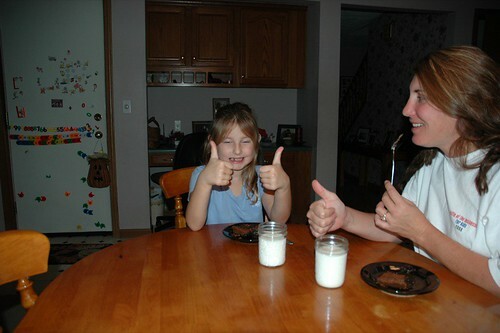 :) This house loves your shadenfreude pie. Thanks! I’ve been looking at this recipe for over three years now and still thinking I really ought to make it some day. Why no, I’m not an early adopter, why do you ask? I am SOOOO going to make this! It sounds like my kind of pie. So going to make this for Dec. 14th when someone who helped cause me a lot of misery has to go to court. Thank you for this recipe. I got tapped to make some dessert for tonight, so I decided to try this. Matters were complicated by the brown sugar my brother-in-law bought having caked itself into chunks that were AS HARD AS ROCKS. I spent a good hour at the second step, whisking everything together while trying to get the brown sugar to dissolve into the mixture. “Chunks of brown sugar,” I said, “your dissolution is entropically favorable. Dee-ess over dee-tee is greater than zero, dammit.” Eventually I managed to invoke the Second Law of Thermodynamics sufficient times that I could move on to folding in the melted chocolate. Anyway, the pie turned out pretty good. Excellent pie though! Thanks for the recipe! We have made the Schadenfreude Pie at long last. But mine stayed rather molten for quite some time. Wonder if I did something wrong….on the other hand, it was tasty. i’m thinking of making this, now that tom de lay just got sentenced to three years in prison!! My 2006 pie came out excellently, and the version without booze worked nicely. The next time I do it, I’m considering trying my hand at making brown butter for the occasion. I mentioned on Twitter that since at least one of my friends does not do corn syrup, we ought to be able to try maple syrup (the darkest grade available, naturally). That should be a separate batch than the brown butter one, to isolate the variable. gonna hate to make this…. sadly for me and a friend. “Murdochalypse” of late (thanks, Marketplace) has made me think of this. So tempted to throw the recipe link up on my Facebook page. Any objections? Finally got around to making this, when I knew I would have many people around to share it with. Delicious. FYI, for those of you who prefer making your own crust, not very gingery gingersnaps make an excellent substitute for graham crackers or chocolate wafer cookies. 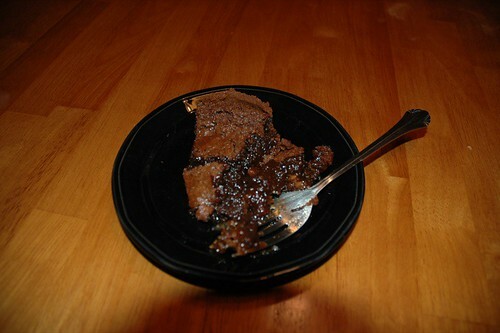 Made this pie tonight, and while it’s very tasty… is it supposed to be so chewy? The top and the graham cracker crust were like chewing taffy. You have MADE my night … now I’m off to bake while I revel that my ex-husband is cheating on his new wife …. @ Amy ~ the ex is cheating on the new wife? Priceless! Can’t wait to try this! Wondering if perhaps those who have mentioned that their pie was runny may have used a bit more than a “splash” of Kahlua? How much is a “splash”…approximately? I am going to the grocers right now! Schadenfreude Pie, my love? What, no Rocky Road to Hell ice cream? It just now occurred to me. Do you have a food dehydrator? Cause we need a recipe for Objectivist Jerky. I’ll take “Things I Never Expected To See” for $1600, A/l/e/x/ John…. Not only is your Schadenfreude Pie recipe on the LIVESTRONG website, the recipe page includes the pertinent nutrition info. Yowser. I wonder if Americans realise that you can buy food that doesn’t come in plastic packages – and tastes like food. Just saw this posted on a thread at Balloon Juice, wonderful creative work! I used to bake pies, and actually won a pie making contest party with a pecan pie that I used Maple Syrup for since I didn’t have corn syrup – major improvement, esp. with Ice Cream! Keep up those creative juices! Anyone think this is peak wingnut yet, or do we have to wait for inauguration? The maniacal laugh at the end is adorable to the nth power for arbitrarily large n.
Actually made this pie, and it’s pretty darned good! Any chance of a UK version, I don’t know where I’d get corn syrup or that pie crust, not sure about molasses either. Sounds really good. And very simple to make. I may have to try this one out. I think Schadenfreude Pie is best served– like revenge– cold. With a nice hot cuppa tea, made from the tears of my detractors. But that’s just me. If you put a little nonfat greek yogurt on top of it, you can eat a larger slice without getting the Rock of Retribution effect. The church which excommunicated me because I’m gay has finally gone bankrupt and closed its doors for good. I made this pie in their honor and invited my friends to celebrate with me. I had a big slice — a full eighth of a pie — and I savored *every bite of it*!!! Thank you, thank you, THANK YOU for this recipe and the story which went with it! Mark, I can’t tell you how much I share your joy! That’s so great.